In 2015, Dana Blickensderfer’s solo exhibition, Flight of the Machine, featured an intimate look into Blickensderfer’s latest series highlighting her family history and connection to the Blickensderfer Typewriter. Dana Blickensderfer’s artist solo show “Flight of the Machine” at Doxa Design Lab + Gallery drew in a large crowd in downtown Tampa during the opening night. 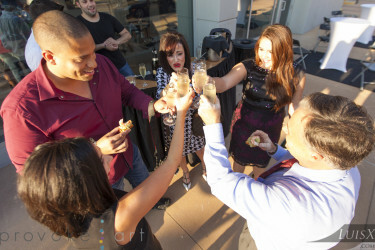 The night life event featured themed cocktails, food and a live DJ. The quaint gallery turned into a lively party celebrating Blickensderfer’s equally lively paintings. “So what is a Blickensderfer anyways? Before the reign of laptop computers, the Blickensderfer was a 20th-century typewriter known for its portability. Painting the different typewriting models through a mode of abstract still life, the artist explores her family’s legacy of accessible, transportable communication. Photographs of these paintings don’t do them justice; you miss out on the lovely textural marks. Working with a loaded brush, the artist hashes her surfaces with thick daubs of paint, using mostly muted, earthy tones with pops of blue and yellow. One work that stands out is “Blickensderfer No1,” a large square painting that sits in the middle of the gallery, acting as the anchor of the show. Immediately drawn to the center of the painting, you can easily get lost in the repetitive horizontal paint strokes, representing the thin, spidery arms of the typewriter. In “Blickensderfer No. 2,” the typewriter becomes an even more abstracted mass in the center of a grid, with a mix of explosive marks and swirls radiating from the machine. Serving as both a title and as unapologetic artist signature, “Blickensderfer” is scrawled out in large, blue letters across the bottom of the painting. The handwriting is messy, formed with thick globs of oil paint, and almost humorous compared to the perfectly formed letters a typewriter creates; it adds the artist’s unique mark to her family’s continued history. To see more of Dana Blickensderfer’s paintings, visit www.danablickensderfer.com.